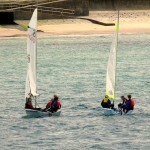 We’re an active sailing & boating (sports) club in the North Coast area. We work with other sports clubs to promote and make sailing accessible to all. We provide a pathway for young people to fulfil their potential in the sport of sailing. Our clubhouse is a meeting place for members and other clubs/groups in our community. Sailing is a sport that can be enjoyed socially or competitively. Competitive sailing requires muscle strength, endurance/agility, physical fitness, mental wellness, relaxation, concentration, decision-making and communication. Many people think sailing is expensive and for only the “elite”. It doesn’t have to be. Through club courses, RYA training can cost as little as £30 per day (for a 5 day summer course), including boat hire. 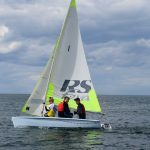 Once you grasp the basics, members can use club dinghies at local sailing events. Sailing isn’t only an exciting experience, it offers a lot of positive benefits to young people’s mental and physical health, decision making and confidence. Its a skill for life. Throughout the summer months, we run a range of training programmes for different ages and abilities, as part of the RYA training pathway. These training programmes provide the quickest, easiest & safest way to learn to sail. On-line Booking in advance is essential for all courses, as numbers are strictly limited. My two boys, Harry and Tommy did your sailing course with James last week. I just wanted to say thank you, and how very much they enjoyed it. They came home full of chat about the things they had learned and are keen to do it again. James was great and the boys really took to him.